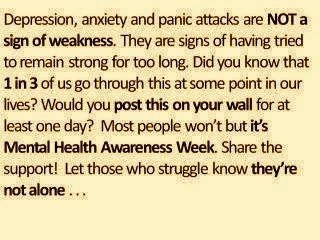 I have just remembered that today is the start of Depression Awareness Week. This might explain why I spotted two articles this morning on Bipolar Disorder that have been written in two different magazines that were published by two major British Sunday newspapers - two harrowing accounts of people's experiences of the illness. Having said that - I must point out that Depression and Bipolar are two different things. Bipolar is quite hard to diagnose because the sufferer tends not to notice the manic/high phases that they go through - one only tends to tell the doctor of the dips and lows. One of the articles is available online and can be found here I can't find a direct link to the other article but this is taken from the writer's actual website rather than the article that I read. "We need to reach a point where we aren't scared of mental illness." She is absolutely right. Don't get me started on the anger that I feel when I hear people brushing aside and criticising those with any kind of mental health problem. After all: "Depression is not a sign of weakness, it is a sign that you have been strong for too long."